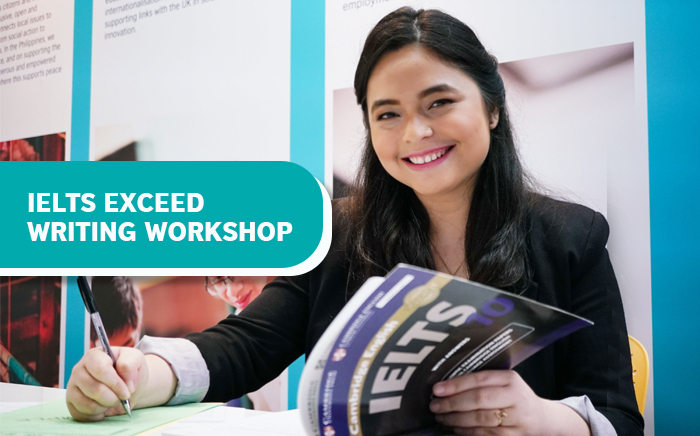 The IELTS Exceed Writing Workshop is an enhanced one-day writing workshop created to assist Filipino IELTS test takers in their preparation for their writing test. Content was derived from an evidence-based study using the writing task outputs of previous Filipino IELTS exam takers. IELTS Exceed was thoughtfully developed by a group of British Council IELTS experts to address common mistakes committed by Filipino test takers in their writing test. This offer is exclusive for British Council IELTS test takers. 1. Register for a paper-based or computer-delivered IELTS test here. 2. Select one of the available sessions in the table above and sign up here. 3. Only pre-registered participants shall be allowed to attend the workshop. No walk-ins will be accepted on the workshop date. 4. Registrations after the cut-off date shall be autmatically scheduled for the next session. 1. Only test takers who entered the signed up through the IELTS Exceed Writing Workshop registration link will be able to avail of the promotion. 2. This promotion is only applicable to test takers who register for a paper-based or computer-delivered IELTS test session with the British Council in the Philippines from April to June 2019. 3. Upon successful registration, test taker will receive an email notification confirming their slot. 4. Slots are in a first-come-first-serve basis. 5. British Council reserves the sole and absolute right to withdraw, amend and/or alter any part of the whole terms and conditions in relation to this promotion at any time without giving any prior notice to the test takers and the test takers agree to be bound by those changes. 4. British Council shall not be liable for any claims by the test takers or third-party claims or loses of any nature, including but not limited to, loss of profits, punitive, indirect, special, incidental, or consequential damages or for other damages and any related claims of any nature, including direct, indirect, third-part, consequential or other damages resulting from or in connection with this promotion. Register for a paper-based or computer-delivered IELTS today! and attend this workshop for free. Sign-up here.